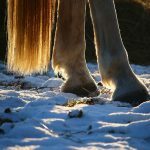 A 10-year-old draft-cross was presented to the Hospital for Large Animals at the Cummings Veterinary Medical Center for evaluation of a ulcerated skin mass overlying the lateral aspect of the left hind fetlock. 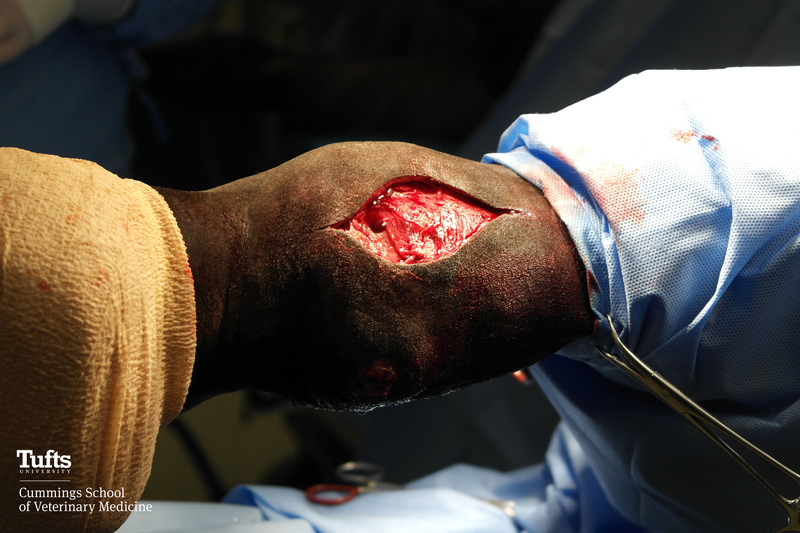 The ulcerated area had been first recognized several months prior to presentation but had not resolved. 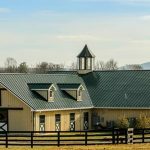 A biopsy was taken and the horse was subsequently referred for further management. On presentation, the horse was bright and alert with normal vital parameters. An approximately 1.5cm diameter ulcerated area was noted to protrude above the surrounding skin of the left hind fetlock. 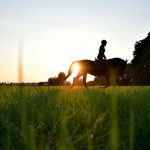 The area was not painful to palpation, and the horse was sound in-hand. Palpation of the remainder of the limb did not identify any other abnormalities. Possible differentials in this case included exuberant granulation tissue, sarcoid or squamous cell carcinoma. 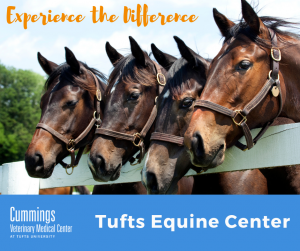 There are both medical and surgical methods for managing squamous cell carcinoma in the horse. Cisplatin2 and 5-flourouracil3 are both recognized as having activity against squamous cell carcinoma and their local use may have been considered in this case. 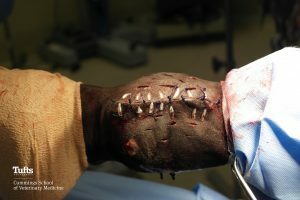 However, if the tumor had continued to enlarge, surgical excision with primary skin closure may no longer have been possible. Surgical management was therefore recommended. The gelding was taken to surgery and positioned in right lateral recumbency. A fusiform curvilinear incision was made and the mass and surrounding skin was excised. As it was not possible to appose the skin edges following excision, several mobilization and tension relieving techniques were employed. These included undermining the surrounding skin and use of full thickness release incisions. Once the skin edges could be apposed, a combination of suturing techniques were used to close the defect. First, vertical mattress sutures using stents were placed as the primary method to counter the tension at the incision site. Interspersed between the vertical mattress, sutures cruciates were placed to further strengthen the closure and provide improved apposition of the skin edges. 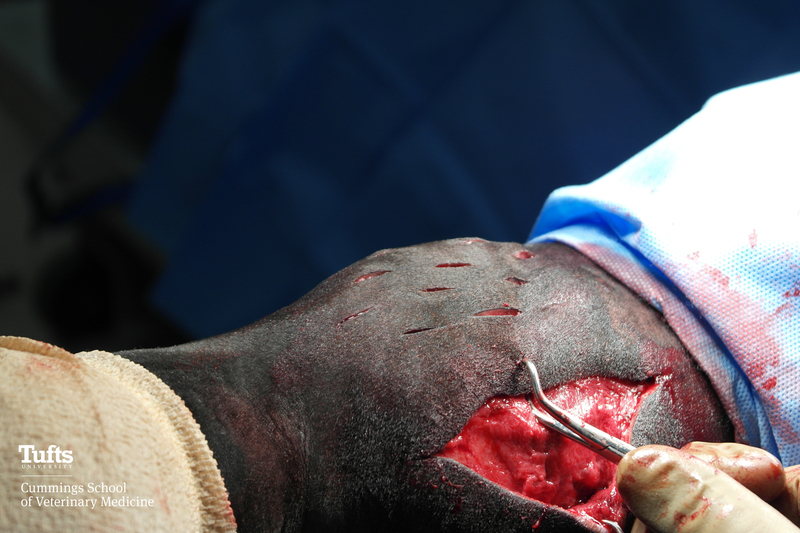 Following surgery, the horse was maintained in a bandage until the time of suture removal. During the first two weeks following surgery, strict stall rest was provided. 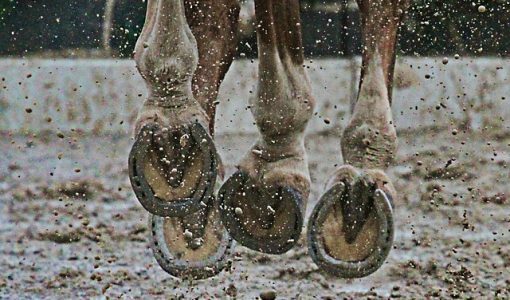 Subsequently, increasing amounts of in-hand, controlled exercise and ultimately small paddock turnout was permitted. Although the possibility of using a local chemotherapy agent at the end of surgery was considered, due to the full thickness release incisions, it was not performed in this case. The tissue excised during surgery was submitted for histopathology that confirmed the previous diagnosis of squamous cell carcinoma. Microscopic evaluation indicated clean margins were obtained. 1: Schaffer PA et al. : Cutaneous neoplastic lesions of equids in the central United States and Canada: 3,351 biopsy specimens from 3,272 equids (2000-2010). J Am Vet Med Assoc. 2013 Jan 1;242(1):99-104. 2: Théon AP et al. 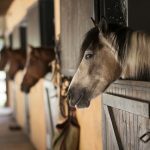 : Long-term outcome associated with intratumoral chemotherapy with cisplatin for cutaneous tumors in equidae: 573 cases (1995-2004). J Am Vet Med Assoc. 2007 May 15;230(10):1506-13. 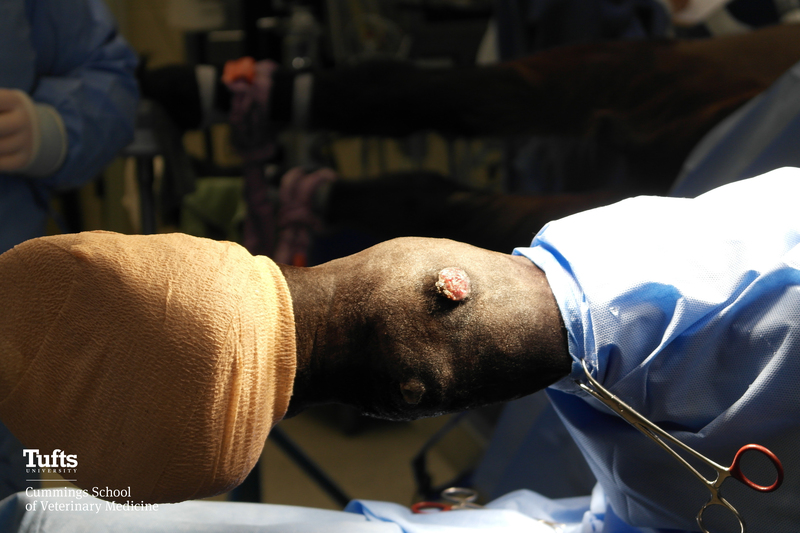 3: Paterson S. Treatment of superficial ulcerative squamous cell carcinoma in three horses with topical 5-fluorouracil. Vet Rec. 1997 Dec 13;141(24):626-8.